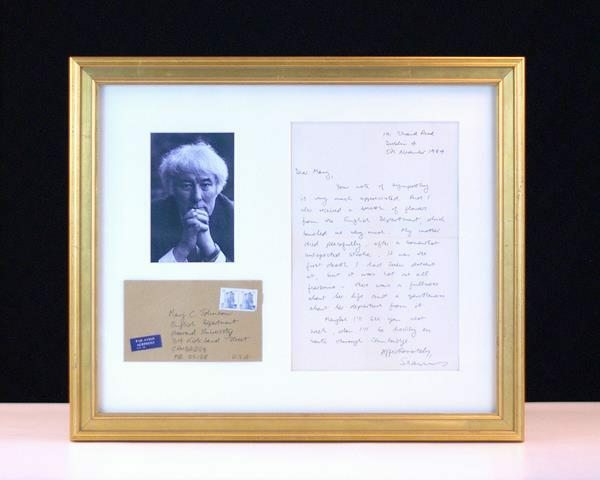 Like his mother, Heaney also suffered a stroke and passed away around the same age. It appears he learned a great deal at his mothers passing in dealing with his own death, as it was said that his last words were in a text to his wife, "Noli timere": "Do not be afraid" in latin. After her death, he wrote a good deal exploring the theme of loss, in particular a sonnet sequence that can be found in his collection, Haw Lantern, published in 1987. She "Taught me between the hammer and the block To face the music. Teach me now to listen, To strike it rich behind the linear black." New York: Wiley and Putnam, 1845. First edition, first printing with the imprints of T. B. Smith and H. Ludwig on the copyright page of one of the most important works in the history of American literature. Several of the dozen stories in this remarkable collection are among the best known in fiction including The Gold-Bug, The Black Cat, The Fall of The House of Usher, and The Purloined Letter. Octavo, bound in three quarters contemporary calf over marbled boards. Housed in a custom clamshell and chemise box. In excellent condition with light browning to the text. BAL 16146; Grolier, 100 American, 55; Heartman and Canny, pp. 90-97; Yale/Gimbel 61. One of the nicest examples we have seen of this scarce highspot of American literature. New York: Henry Holt and Company, 1942. First edition, second printing of Frost’s Pulitzer Prize-winning collection of poetry. Octavo, original cloth, engraved frontispiece portrait of Frost. Signed by Robert Frost on the front free endpaper. Near fine in a very good dust jacket with some chips to the crown of the spine and rear panel. Jacket design by Alan Haemer.